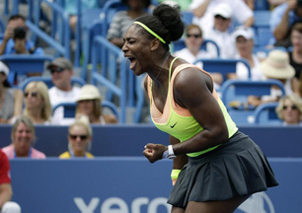 Serena Williams pumped her fist after each important point and screamed as she smacked another emphatic shot. The defending Cincinnati champion wasn’t going to ease into the tournament. Novak Djokovic won his rain-delayed opening match, beating Benoit Paire 7-5, 6-2 in 1 hour, 39 minutes. She’s already starting to get locked in on New York by limiting her responsibilities away from the court. “I’m really trying to stay away from stress and stay away from press,” Williams said. “But, you know, that’s a little difficult. The start of the day’s matches was delayed 35 minutes because of rain, which fell again shortly after Williams completed her win. Her sister, Venus, dropped out of the tournament Tuesday night with an illness. Maria Sharapova also dropped out with a lingering injury to her right leg. On the men’s side, Djokovic waited out a long rain delay before his match started, and then wasted chances to close it out quickly. He converted only 5 of 15 break points during the match. The first set lasted 64 minutes. Fourth-seeded Stan Wawrinka rallied for a 3-6, 7-6 (3), 6-3 win over Borna Coric. The French Open champion didn't take control until he broke Coric's serve in the sixth game of the third set and then held for a 5-2 lead. He will meet Ivo Karlovic in the third round. Twelfth-seeded Richard Gas­quet survived a first-set tiebreaker and advanced with a 7-6 (5), 6-2 win over qualifier Thanasi Kokkinakis. Gasquet will face seventh-seeded Marin Cilic in the third round. Tommy Robredo beat Sam Querrey 6-1, 5-7, 6-3 after the third set was delayed by rain.